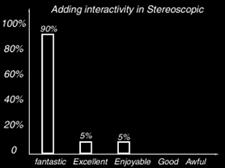 90 % from the people finds it is a good idea to add interactivity by merging this stereoscopic 3D. This helps and also enhance the depth perception of the viewer...so this technology would be a better used if it is used to perceive depth than just to enhance any image. Besides that it is also found that it is nearly impossible to gain knowledge about this technology. From the survey it was found that 99% of them agree it is very very hard to get to know this technology... developing this technology it could expose to the market in Malaysia.